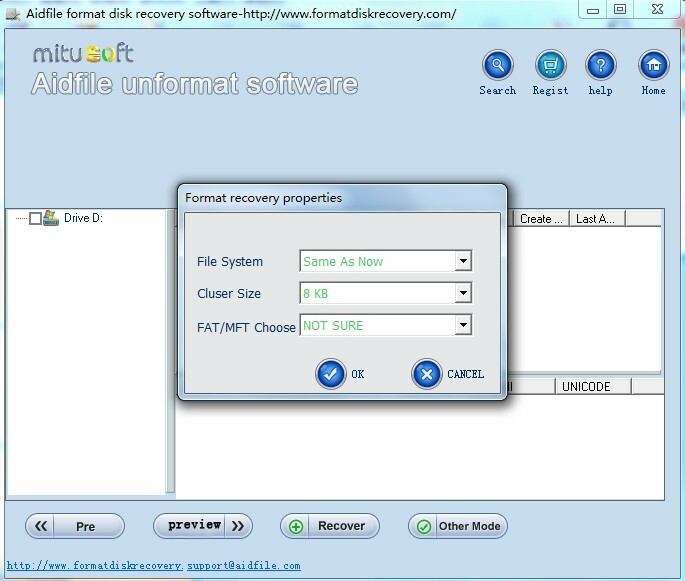 Aidfile format disk recovery - quick format recovery to recover files from formatted hard drive and external hard drive SSD partition . - best formatted recovery software for recovering photos documents data files after formatting flash drive,external hard drive pen drive,usb drive on Windows 7,Windows 10,Windows 8,Windows 8.1,Windows XP,Windows Vista. 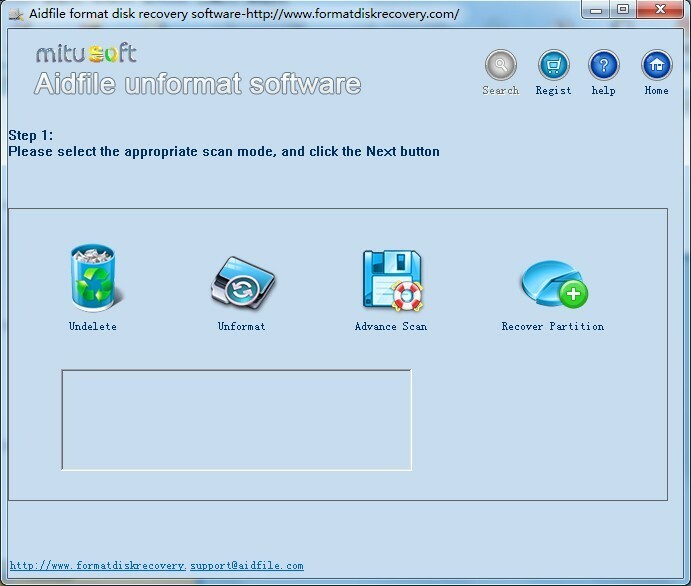 Aidfile format drive recovery software can help you for recovering photos, pictures, videos, Word documents, Excel, PDF and other files from formatted flash drives, pen drive, thumb drive, memory sticks, SD cards, USB , CF cards or other external hard drives. It supports Exfat/FAT32 / NTFS file systems. Recover from hard drive, USB drive, memory stick, digital camera card, floppy disk storage media. How do you recover data from a formatted drive? After you quick format or full format or a drive, the operating system erases all information on the disk, tests the hard drive to make sure all sectors are reliable, marks bad sectors, and creates internal address tables that it later uses to locate information. You must format a disk before you can use it. But reformatting a hard drive does not erase all the data on the drive, only the data on the partition tables. So, people cannot access the files; however, if you accidentally reformat a drive that has important data, such as videos, Office documents or photos, you may use Aidfile recovery for help. This data recovery works on high-level formats, the type of formats that most users execute. In addition, hard disks have a low-level format, which sets certain properties of the disk, such as the interleave factor. After you format your hard disk accidentally, you will be missing many important files, such as Word documents, PDF files, Excel sheets, photos, videos, letters, statements, etc. If a drive is formatted, you can select "Unformat" to scan. Also, you could select "Advance Scan" to find lost files by file type, or you can select "Recover partition" to scan if the partition size or partition position has changed by formatting the drive. There is no need to ask is anyway I can retrieve lost files from formatted hard drive,of course it is possible. Which data storage devices are supported? Aidfile data recovery program can give you the best solution to restore, rescue and repair missing or lost data and files such as MP4, hard drive Exfat, Fat32 and NTFS partitions, USB flash drive, memory card, pen, SD card, digital cameras, CF card, flash , xD picture card, etc. Which type of files support? As the most powerful format drive data recovery tool, this utility can get most formats of files back, such as Microsoft Office documents (MS Word .doc and .docx files, MS Excel .xls files, MS PowerPoint .ppt files, MS Outlook pst email files, BMP images, JPG/JPEG photos, GIF picture files, TIFF photo files, PNG picture files, Lotus office notes and files, PDF files, mp4 videos, avi video files, 3gp files, mp3 music, RMVB movies, RM films, winrar zip files) . 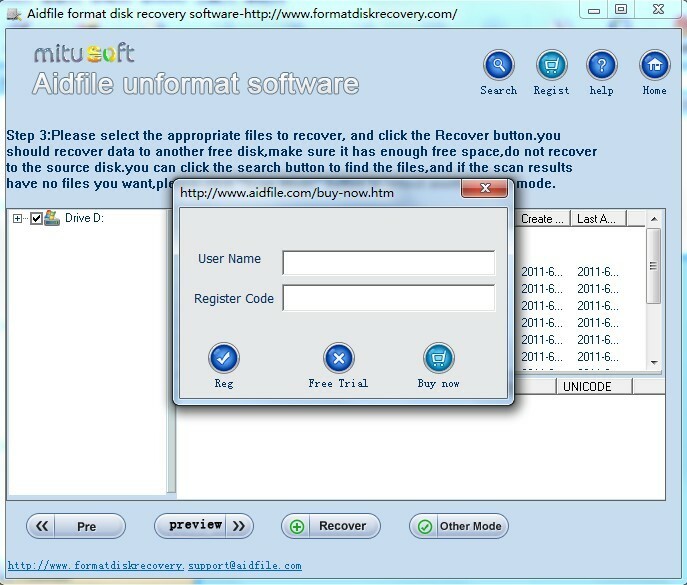 As the best unformat application, Aidfile can help you undo a format with any version of the Windows, including Windows 2000, Windows XP, Windows 2003, Windows Vista, Windows 2008, Windows 7, Windows 8,Windows 8.1and Windows 2012. As a complete laptop IDE hard drive RAW unformat software, Aidfile can help you undo a hard drive format with most hard drives, including Western Digital (WD) hard drive, Seagate hard drive, Toshiba, Samsung, Sony, Maxtor and Sata hard drive. It can help you repair damaged or formatted partition tables. Can I recover files from other devices that are not Exfat/FAT32/NTFS file systems? The answer is yes. Use Aidfile "Full Scan" mode to recover photos, videos, documents and so on from an SD card or other hard drive if the file systems are not Exfat/FAT32/NTFS. Format Recovery : When users inadvertently format the hard disk or other storage devices’ partitions and the position and size of the partitions haven’t been changed, they can use the “unformat” software for recovery. This function supports the partitions, which are Fat32, Exfat or Ntfs before formatting or are Fat32, Exfat or Ntfs after formatting when recovering. 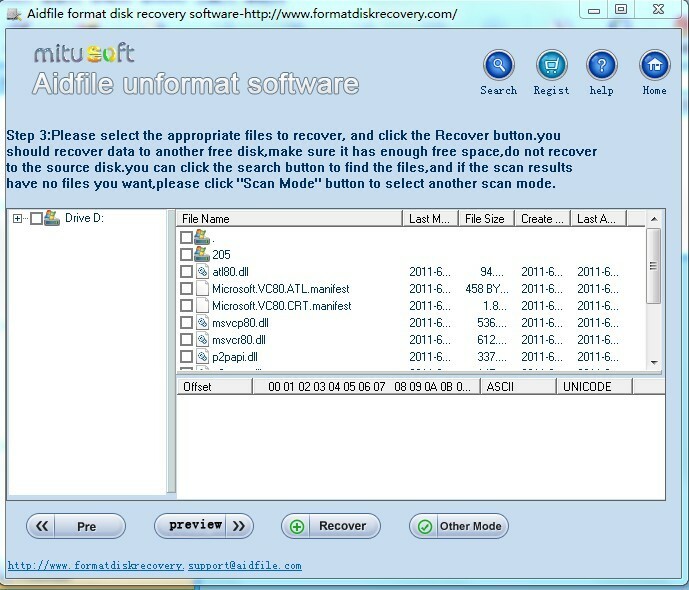 Deleted Recovery : If the users mistakenly remove the files (shift + delete, empty the recycle bin or delete the files while cleaning viruses) and the file system is Fat32, Exfat or Ntfs, they can scan and recover the files using the “undelete” function. 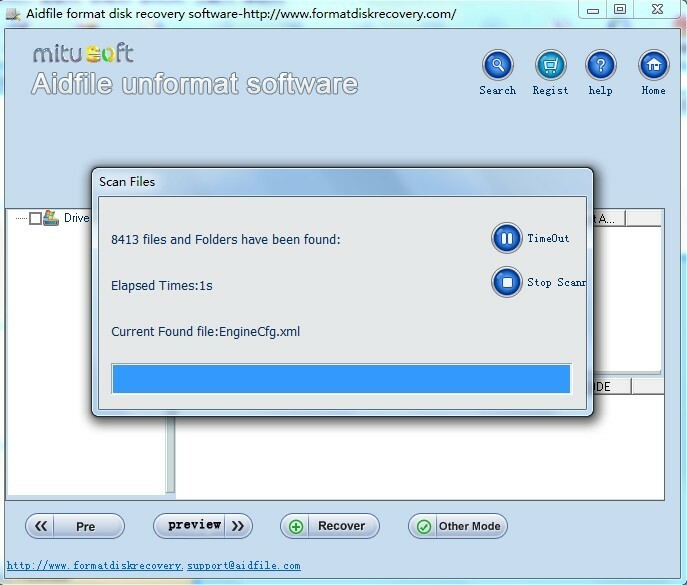 This data recovery software’s undelete-scanning is very fast with strong functions. Also, it can scan many files by file type. Partition Recovery : When partitions are lost or cannot be accessed due to users’ mistakenly deleting the files or other reasons, or the position or size of the partitions are changed when the users format them; this software can quickly scan and find the partitions and recover all the data files.